I was invited to present a new work, Hangmen Also Die, in OSCENE 10 at the Laguna Art Museum in Laguna, CA (Feb. 12-May 16, 2010). OSCENE 10 is a high-visibility annual survey of contemporary art and culture in Orange County. Recently I have been extending my practice as a director and theater maker into the different context of gallery installations as a way of exploring possibilities that are difficult to realize in traditional theater venues. 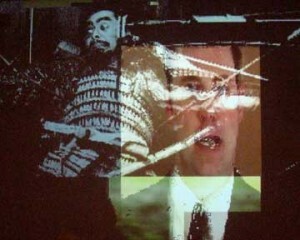 In the installation, video from various sources–including most crucially the filming of a live performance by an actor on opening night–is programmed into an evolving collage that is projected on a wall at large scale. The video collage was programed to cannibalize itself and decay over the course of the exhibition until almost nothing was left. The text of the monologue addresses the tendency for certain types of political action to undermine their own objectives by corrupting the individuals involved. In this way, the programmed degradation of the installation rehearses the theme of corruption. Highlights from the text include extracts from my project of several years ago, Galileo in America, Hiener Müller’s performance text Mauser, and Bertolt Brecht’s The Measures Taken. The full monologue can be viewed here. Some additional information with videos and images from the event.